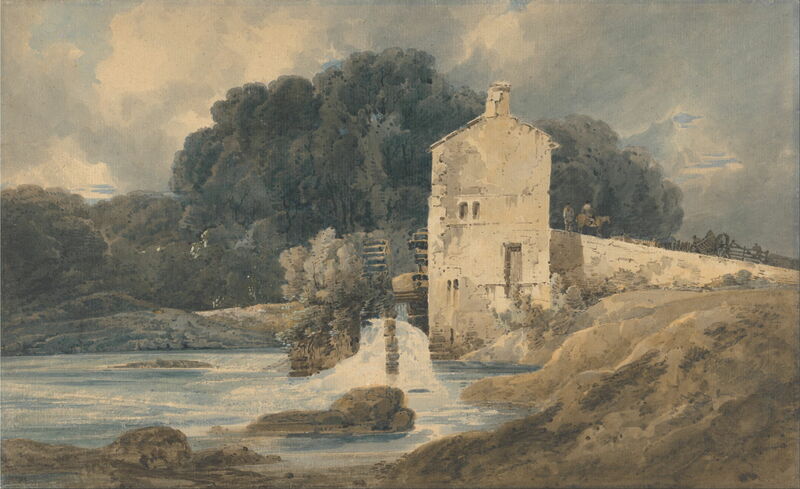 Thomas Girtin (1775–1802), The Abbey Mill, Knaresborough (1801), watercolor, 32.2 x 52.5 cm, Yale Center for British Art, New Haven, CT. Wikimedia Commons. In the first part of these two articles on the tragically brief life and work of Thomas Girtin (1775–1802), I looked at his work from his initial watercolours of around 1790 to his success – both artistically and commercially – in around 1797. In 1798, he was again well represented at the Royal Academy, with nine of his watercolours being hung in its annual exhibition. During the late summer, he toured North Wales, making sketches which he then worked up into finished paintings over the winter. 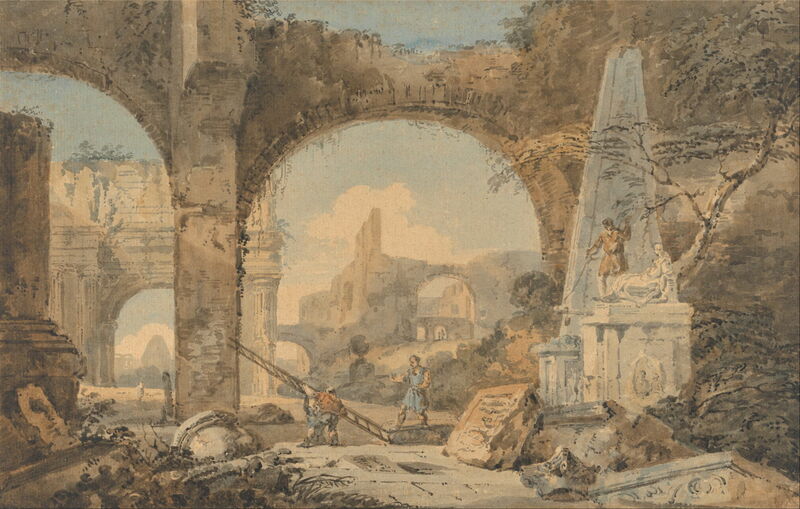 He also started to paint beyond the boundaries of the topographical view, as in this atmospheric capriccio among the Roman ruins, Classical Composition (1798-9), after Marco Ricci (1676–1730). Thomas Girtin (1775–1802) after Marco Ricci (1676–1730), Classical Composition (1798-9), watercolor over graphite on moderately thick, moderately textured, laid paper, mounted on very thick cardboard, 30.5 x 47.8 cm, Yale Center for British Art, New Haven, CT. Wikimedia Commons. The results of his previous year’s visit to North Wales resulted in acclaim of the six watercolours which he showed at the Royal Academy in 1799. However, his hopes of accompanying Lord Elgin to Greece on an archaeological expedition failed. In the end, Elgin employed the Neapolitan watercolour painter Giovanni Battista Lusieri (1755-1821) to document the expedition and its archaeological discoveries. Girtin’s tour that year was to Yorkshire, a far cry from Greece, but which saw him venturing into more transient effects of light, and de-emphasising architectural features. 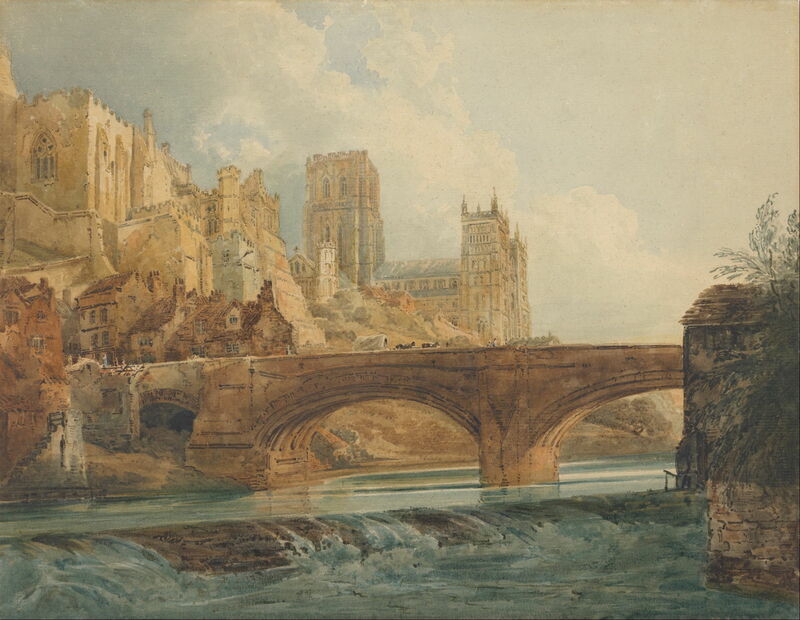 Thomas Girtin (1775–1802), Durham Cathedral and Castle (c 1800), watercolor over pencil heightened with gum arabic, 37.5 x 48.9 cm, Getty Center, Los Angeles, CA. Wikimedia Commons. His wonderful view of Durham Cathedral and Castle (c 1800) contains as much detail as his earlier views, but it is better integrated into the whole instead of competing for the viewer’s attention. 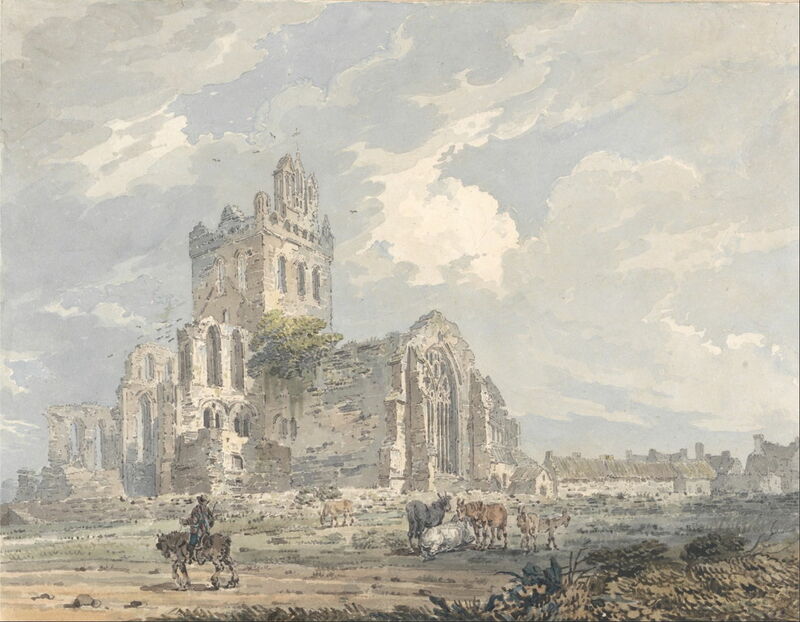 Thomas Girtin (1775–1802), Jedburgh Abbey from the South East (1800), watercolor, gouache and graphite on medium, cream, moderately textured laid paper, 66 x 79.1 cm, Yale Center for British Art, New Haven, CT. Wikimedia Commons. The ruined abbey at the centre of his Jedburgh Abbey from the South East (1800) bears only the marks of the brush, not of the pen. Thomas Girtin (1775–1802), Ripon Minster, Yorkshire (1800), watercolor with pen in black and brown ink, with scraping over graphite on medium, slightly textured, beige, laid paper, 31.4 x 47.6 cm, Yale Center for British Art, New Haven, CT. Wikimedia Commons. 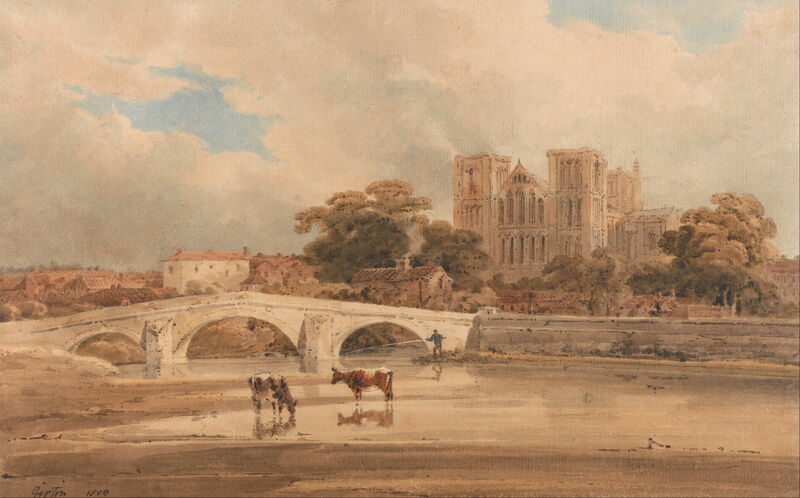 In his Ripon Minster, Yorkshire (1800), it is the features of the river – its bridge, cattle, and a single angler – which steal the gaze, rather than the bulk of the minster behind. In 1800, he showed his last watercolours at the Royal Academy. He also managed to tour two areas, returning to Yorkshire, where he concentrated his sketching along the River Wharfe. Then in the late summer he went back up to the Scottish borders, before marrying in the autumn. Among the paintings which he completed in 1800 was The White House at Chelsea, which is probably his most famous. Girtin chose to look upstream of the River Thames from a location close to the modern Chelsea Bridge. The landmarks shown include, from the left, Joseph Freeman’s windmill (or Red House Mill), a horizontal air mill, the white house close to where Battersea Park is now, Battersea Bridge, and Chelsea Old Church. For once, buildings are the least significant elements in the painting, which is dominated by the sky, water surface, and the momentary light on the white house. 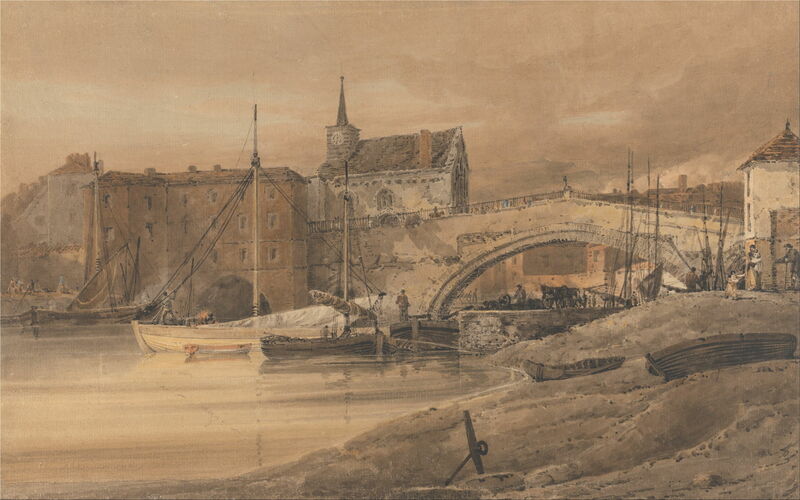 Thomas Girtin (1775–1802), Ouse Bridge, York (1800), watercolor with pen and brown ink over graphite, with scratching out on medium, beige, rough wove paper, 32.9 x 52.4 cm, Yale Center for British Art, New Haven, CT. Wikimedia Commons. His paintings from the campaign in Yorkshire were also quite different. Instead of concentrating on cathedrals and other prominent buildings, the River Wharfe was now the centre of his attention. Here, the Ouse Bridge, York (1800) and the small boats using the river are more dominant. In his The Abbey Mill, Knaresborough (1801), the mill building is a smaller and less prominent part of the painting, with the river and trees more dominant. He has also used significant areas of ‘reserved’ white space and a drier brush on the rough surface of the paper to depict ‘white’ water and highlights. 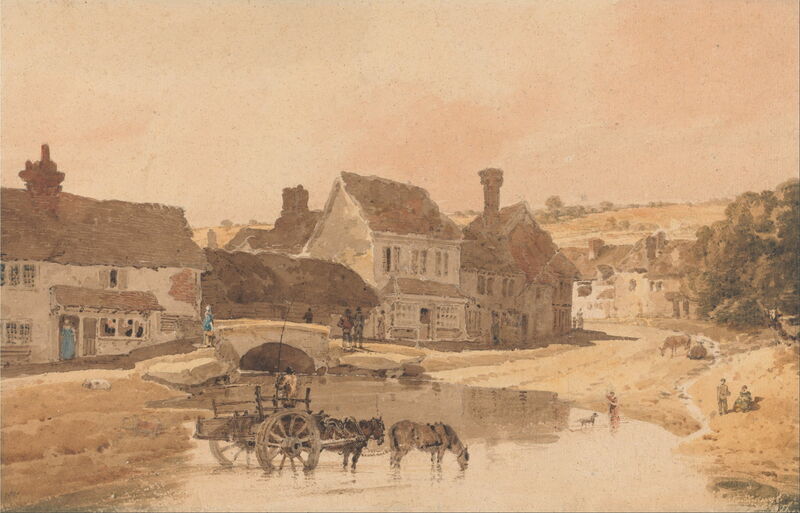 Thomas Girtin (1775–1802), The Village of Kirkstall, Yorkshire (1801), watercolor with pen in black and brown ink over graphite on beige, moderately thick, moderately textured, wove paper, 31.6 x 48.9 cm, Yale Center for British Art, New Haven, CT. Wikimedia Commons. Another superb product from his Yorkshire tour the previous year, Girtin’s The Village of Kirkstall, Yorkshire (1801) shows an angler fishing from his cart in the ford in a sophisticated composition. The following year, 1801, Girtin exhibited an oil painting at the Royal Academy, the only oil painting which he appears to have shown. This was met with great acclaim, but has since been lost. He toured Yorkshire for the last time, and then spent the winter of 1801-2 in Paris. 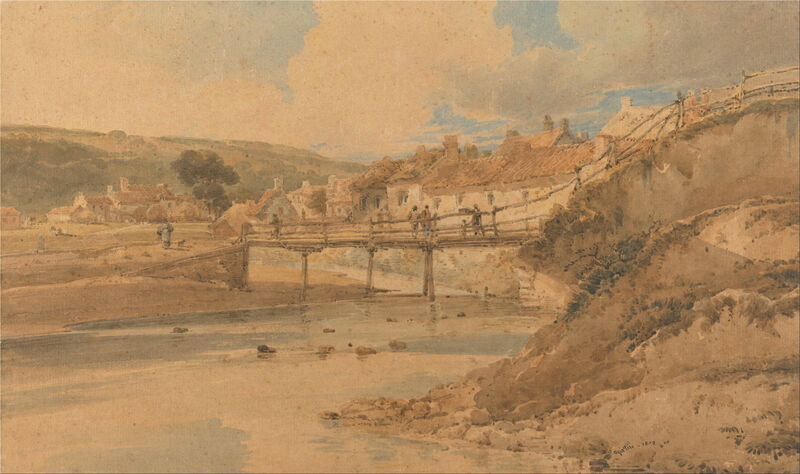 Thomas Girtin (1775–1802), Sandsend, Yorkshire (1802), watercolor over graphite on moderately textured, laid paper, mounted on very thick, cartridge paper, 31.8 x 53 cm, Yale Center for British Art, New Haven, CT. Wikimedia Commons. 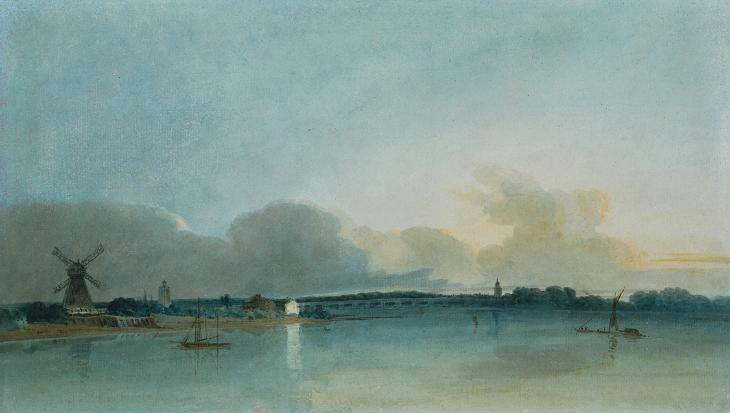 In addition to completing watercolours from his tour in 1801, Girtin spent much of the spring and summer of 1802 producing watercolour studies, and then the final 5.5 x 32.9 metre panoramic painting, for Eidometropolis in London. This was finished by its opening on 2 August 1802, and was a major speculative commitment on Girtin’s part. Unfortunately it does not appear to have been a commercial success, and the panorama has since been lost. Opinion is that, although his studies were made in watercolour (and survive), he painted the panorama itself in oils, whose relative unfamiliarity could only have made the task more difficult. Most such panoramas were painted in tempera. 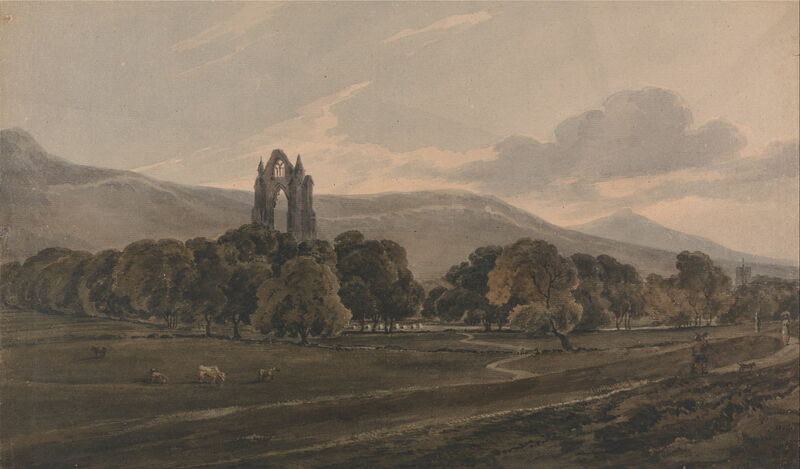 Following one of his visits to North Yorkshire, Girtin painted Guisborough (Gisborough) Priory in watercolour. Thomas Girtin (1775–1802), Guisborough Priory (date not known), watercolor over graphite on medium, moderately textured, beige, laid paper, 30.3 x 51.1 cm, Yale Center for British Art, New Haven, CT. Wikimedia Commons. The Yale Center for British Art has an oil painting apparently made from this view, which some believe to have been the only surviving oil painting by Girtin. However others dispute this attribution, considering it too crude to have been painted by him. 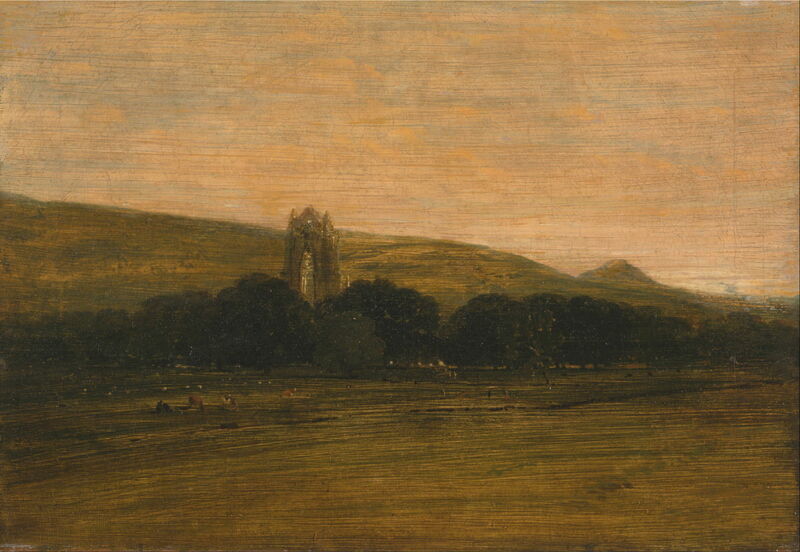 Thomas Girtin (1775–1802), Guisborough Priory (1800-2), oil on canvas, 34.9 x 50.2 cm, Yale Center for British Art, New Haven, CT. Wikimedia Commons. Over the last year or so, Girtin’s health had been troubling him more, and he died, probably of an asthma attack or possibly from a complication of pulmonary tuberculosis, on 9 November 1802, aged 27, just a fortnight after Richard Parkes Bonington was born. 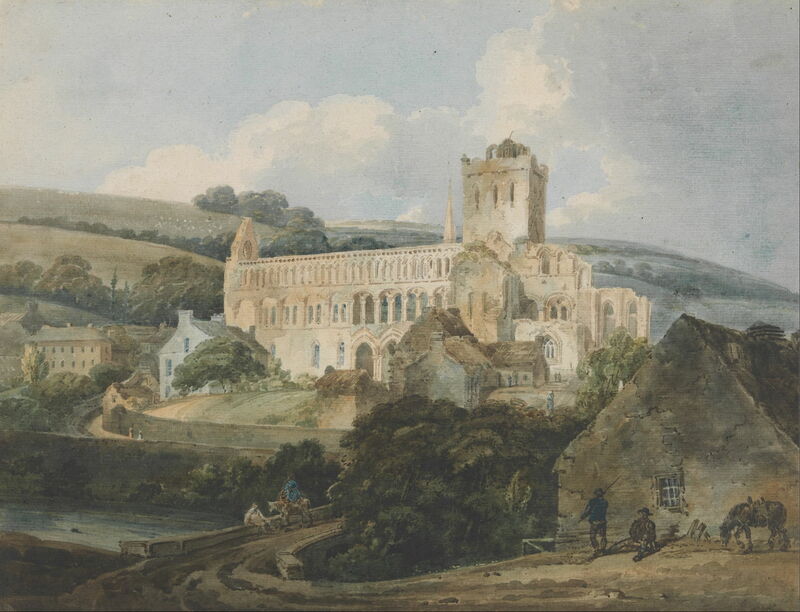 In little more than a decade, Thomas Girtin had mastered the techniques of the ‘British’ school of watercolour, and had then started to take watercolour beyond that, exploring the effects of light, sophisticated composition, and ‘advanced’ techniques; this is shown in the pair of paintings of Jedburgh Abbey below, made just seven years apart. These were a great influence over JMW Turner, John Sell Cotman, and other painters of the nineteenth century. Thomas Girtin (1775–1802), Jedburgh Abbey, Roxburghshire (c 1793), watercolor over graphite, and gray wash on moderately thick, slightly textured, beige, wove mount paper, 24.8 x 29.7 cm, Yale Center for British Art, New Haven, CT. Wikimedia Commons. However, Girtin painted almost exclusively landscapes, and almost exclusively in watercolour. Turner’s broader training in the Royal Academy Schools enabled him to excel in other genres, and most importantly in oils as much as in watercolour. Most of Turner’s best works were created well after Girtin’s death, and there is no way of knowing whether Girtin would have been as successful in other genres, or in oils. He was, though, a vital part of the development of painting in Europe in the nineteenth century. Smith G (2002) Thomas Girtin: the Art of Watercolour, Tate. ISBN 978 1 854 37394 6. Posted in General, Painting and tagged Bonington, Cotman, Girtin, painting, Turner, watercolour. Bookmark the permalink. Sunday scare: had I been hit by ransomware?